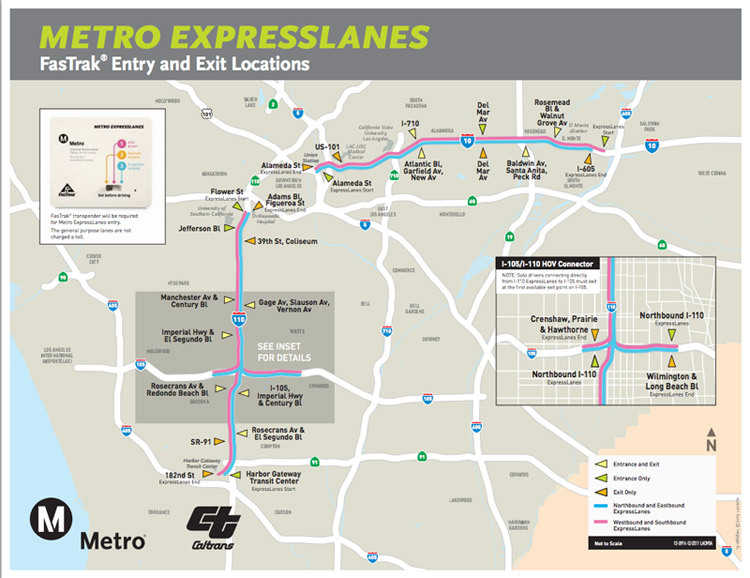 Following on the heels of the successful opening late last year of 11-miles of Metro ExpressLanes along the Harbor Freeway and with more than 80,000 Fastrak® ExpressLanes transponders now issued, Metro plans to open an additional 14 miles of Metro ExpressLanes along the I-10 San Bernardino Freeway at 12:01 a.m. Saturday, February 23, 2013, weather permitting. For the past couple of months, motorists have been seeing messages on the giant display message boards along the I-10 San Bernardino Freeway in preparation for the opening of the Metro ExpressLanes. The ExpressLanes program seeks to reduce congestion by improving travel choices in the two corridors. Carpools, vanpools, and motorcycles will travel toll free. All motorists will need a FasTrak® transponder to travel in the ExpressLanes. Metro, in partnership with Caltrans, is embarking on a one-year demonstration program that converts 11 miles of High Occupancy Vehicle (HOV) lanes on the I-110 (Harbor Freeway) between the 91 Freeway and Adams Boulevard near downtown Los Angeles and 14 miles on the I-10 San Bernardino Freeway (El Monte Busway) between Union Station/Alameda Street and the I-605 Freeway to High Occupancy Toll (HOT) lanes that allow solo drivers to use the lanes for a toll. The Harbor Freeway ExpressLanes opened to the public on Nov. 10, 2012. “When solo drivers begin to travel on the ExpressLanes along the San Bernardino Freeway, all commuters will benefit—whether they pay a toll or not—because the ExpressLanes will redistribute traffic across all lanes of the freeway,” said Los Angeles County Supervisor Mark Ridley-Thomas, who also is a Metro Board Member and Chair of the Ad-Hoc Committee on Congestion Pricing. When the I-10 ExpressLanes open in February, the rules for carpools on the I-10 freeway will stay the same as they are today. Carpools are three or more people traveling during peak travel times of 5 a.m. to 9 a.m. and 4 p.m. to 7 p.m. Monday to Friday, with holidays excluded. During peak travel times, carpools of just two people can travel in the I-10 San Bernardino Metro ExpressLanes for a toll. All other times, they will travel toll-free in the ExpressLanes. At all times on both freeways, the general purpose lanes are not tolled. Net toll revenues will be reinvested in the corridor where they are generated for transportation improvements. To prevent backups in the ExpressLanes, the tolls will be adjusted from 25 cents a mile to a maximum of $1.40 a mile and will increase as the number of vehicles in the ExpressLanes increase. “Caltrans’ High Occupancy Vehicle (HOV) lanes are the most prolific in the nation,” said Caltrans District 7 Director Mike Miles. “ExpressLanes are the next logical progression in reducing congestion as the state moves from freeway building to intensive operations management,” he said. Construction workers have been busy over the last year installing a host of power and utility support units needed for the operation of the dynamic message signs along the I-10 San Bernardino Freeway corridor. These signs began their testing phase late last year displaying information regarding the ExpressLanes program. The testing will continue until the system is opened to the public on February 23.For now, the carpool lanes are still operating on the I-10 freeway until the conversion to Metro ExpressLanes, so solo drivers cannot use FasTrak® on the I-10 freeway until the ExpressLanes open next month. As part of the testing of equipment, carpools with a FasTrak® transponder may hear a beep when traveling in the HOV lane on the I-10 freeway. This means the equipment has detected the transponder but no tolls are being assessed and no information is being transmitted. Along the I-10 freeway, an additional toll lane has been constructed in each direction between the 605 and the 710 freeways to add capacity along that heavily traveled corridor. Prior to the ExpressLanes, there was only one carpool lane operating in each direction along the El Monte Busway. None of the general purpose lanes will be taken away to convert the lanes and make the improvements. The costs vary depending on payment methods. Drivers who open their accounts with a credit or debit card will pay $40 and the transponder deposit will be waived. The $40 will be applied to any tolls incurred while driving solo in the Metro ExpressLanes. There is a $3 monthly account fee, which will go into effect when the I-10 Freeway ExpressLanes open next month. The monthly fee is waived after four one-way trips in the Metro ExpressLanes and/or on travel on eligible transit in the ExpressLanes corridor. Discounts are available at participating Albertsons and Costco stores as well as at branch locations of the Automobile Club of Southern California.In a first for an ExpressLanes project, low-income commuters can receive a $25 toll credit when setting up an Equity Plan account, and the transponder deposit will be waived. They must reside in Los Angeles County and have an annual income below $37,061 for a family of three. There is a limit of one Equity Plan account per household. The Metro ExpressLanes program is a $290-million project funded by a $210-million federal grant by the U.S. Department of Transportation as part of the Congestion Reduction Demonstration Program. Nearly $120 million is going towards actual construction costs associated with the toll lanes. The remainder of the money is being used to improve various transportation hubs along the two corridors including the Harbor Gateway Transit Center along the 110 freeway and the construction of a new El Monte Station along the I-10 freeway. In addition, the project funded the purchase of 59 new clean fuel buses to provide additional bus service along the two corridors and 100 new vanpools. Along the I-10 San Bernardino Freeway, additional Metro Silver Line bus service is now operating along with Silver Streak bus service offered by Foothill Transit. Both Metro and Foothill Transit bus passes are honored on either line as an added customer convenience. The ExpressLanes project is being constructed by Atkinson Contractors, LP under contract to Metro. The contractor was competitively selected to design-build-operate-and-maintain the ExpressLanes project. The Atkinson team included AECOM for design and Xerox/ACS Inc. for tolling integration. Here's the agenda for first full Metro Board of Directors meeting of 2013; buenas manana and bon appetit! Now Metro is going to ruin traffic on the 10 just like the 110. Everyweekend the 110 is backed up with traffic while the express lanes are empty. when are they going to admt it is a failure. Metro has sold out LA drivers for the bebefit of a few people willing to pay to drive solo. It is wrog and needs to be discontinued. Very sad. There is no carpool for us anymore. We use it not every month and don’t want to pay $3 fee for nothing. I can imagine that traffic on weekend. I wish occasional motorists won’t be penalized for not using the Express Lanes ($3 monthly fee) in a given month and also drafting automatically any amount for previous usage to fill $40 from the original form of payment. I’m referring to occasional motorists on the Express Lanes mostly.